Kamala Harris: Obama's comments were inappropriate, but the backlash was overblown. 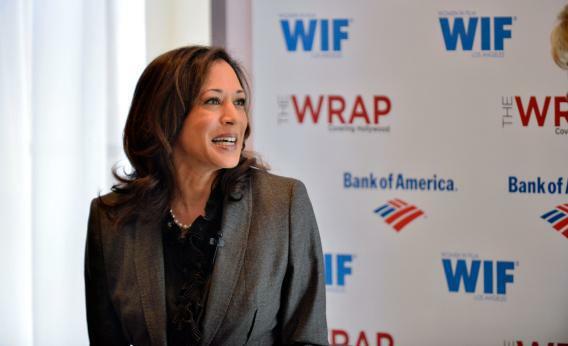 California Attorney General Kamala Harris participates in TheWrap’s ‘The Power Of Leadership’ brunch at Scarpetta on December 13, 2012 in Los Angeles, California. But if you want to take it all seriously, you can’t do better than Joan Walsh’s frustrated jeremiad. * Walsh profiled Harris in 2003, when she was merely a rising star. She heard the smears, all about how Harris was only rising because she was beautiful. Yes, in the right circumstances, male politicians get that too—John Edwards never overcame his reputation as a pretty boy, and ironically that was the apex of his public acclaim—but Harris got it worse. And now the crusading attorney general of California, a leading light on foreclosures and other banks-versus-people issues, is most famous as a character in a gaffe story. I doubt Obama knew any of the lurid history of Harris’s opponents smear attempts. I assume he thought he was just paying someone he admires a compliment. But most women in public life have a complex relationship with their appearance, whether they’re as attractive as Harris or not. Those of us who’ve fought to make sure that women are seen as more than ornamental – and that includes the president – should know better than to rely on flattering the looks of someone as formidable as Harris. Why not praise her Homeowners’ Bill of Rights? Calling her “by far, the toughest attorney general” would have had a better ring. Correction, April 7, 2013: This post originally said Irin Carmon wrote the excerpted Salon piece.